Pull out all the stops with the Shopware Professional Plus, which comes as the true all-inclusive package for successful online trading. To encourage the possibilities of your online shop even further, this edition includes every Premium Plugin developed by Shopware as well as support directly from us, the manufacturer. Created and developed by Shopware, Shopping Worlds were designed to help you reach your customers on an emotional level and awaken their desire to make a purchase. Now with several free Shopping Worlds presets to choose from, this plugin makes working with this feature easier than ever and brings you a considerable competitive advantage. 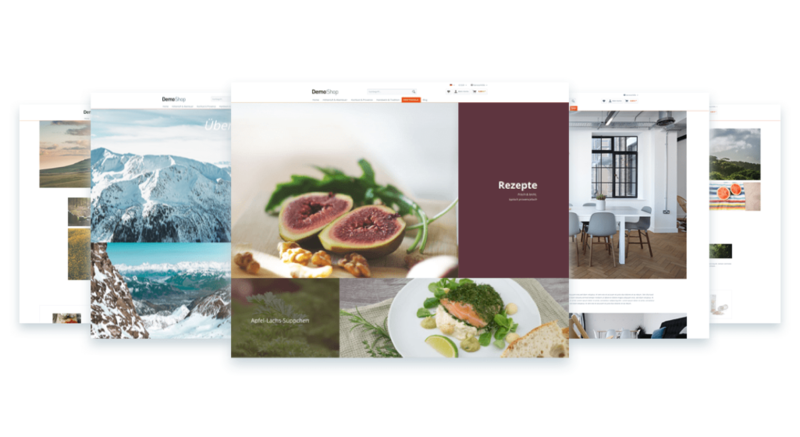 These presets come neatly packed with predefined image and text snippets, which can be individually customised following the usability known from Shopware’s backend. All images contained in the presets are licence-free and therefore available to use in your shop for absolutely no cost. Cater to your customers with individualised product offers using the new Customer Streams. With the new Customer Streams, you can filter your customers based on the criteria you define and present products that are perfectly tailored to their interests. Whether newsletters, vouchers or content on your landing page, streams will adjust to show content that speaks to your customer’s individual interests. Customer Steams work perfectly together with Product Steams. Product streams draw your customers’ attention to specific assortments – assortments which you have already defined, behind the scenes, using conditions. For instance, you can present the latest products from a certain category (condition 1), of a particular manufacturer (condition 2), in a particular price range (condition 3), using a few simple mouse clicks. Product streams can appear at decisive points in your shop, such category pages, product detail pages or in shopping worlds. The highlight: product streams automatically update themselves. So when any new product meets the defined filter criteria, the system updates the stream without you having to lift a finger. Subshop licences are a direct part of Shopware’s core and integrated free of charge. Subshops make it possible to implement either large-scale projects with different language shops or quickly and inexpensively target groups, making it all the easier for you to build your ideal online shop. The standard version of Shopware includes many innovative and unique features that give the software a basis for creating an attractive and sophisticated online store. Shopware is modular and can be expanded using plugins and modules. “Start small” and add unlimited new features and functions to compliment the growth of your business. Should you choose the Community or Professional Edition, you always have the possibility of seamlessly upgrading to the Enterprise edition. With the Shopware Professional Plus, our exclusive features were designed specifically so that you can achieve advanced eCommerce. Take advantage of Storytelling, the Import/Export feature and of course benefit from our technical support. When you purchase the Professional Edition, you automatically receive a 12-month Silver Support subscription. For this period, you are entitled to full professional support, which includes a manufacturer warranty from Shopware. You also benefit from guaranteed response times, which are essential for “mission critical” situations. Nothing lasts quite like a good story—a completely new and novel feature, Storytelling sends customers through personalized voyages in your online shop. Through engagement on a personal level, customers are able to develop completely individual ties with your brand. With Digital Publishing, you can easily create dynamic banners, directly from your Shopware backend. Cut-off text or buttons that appear misplaced are now a thing of the past - now you have completely new design possibilities. The new Shopware ERP powered by Pickware offers you fundamental ERP functions in your Shopware backend. This powerful system is directly and freeofcharge integrated in the Professional and Professional Plus editions of Shopware 5.2. Therefore, you don’t need any interfaces or data duplication in other systems – all data is centrally maintained and managed in your Shopware backend. Furthermore this tool expands your shop by many useful features, which faciliate your daily work. This includes supplier management incl. ordering, stock overview, inventory maintenance, detailed analysis options and much more. Evaluation of turnover, earnings, etc.